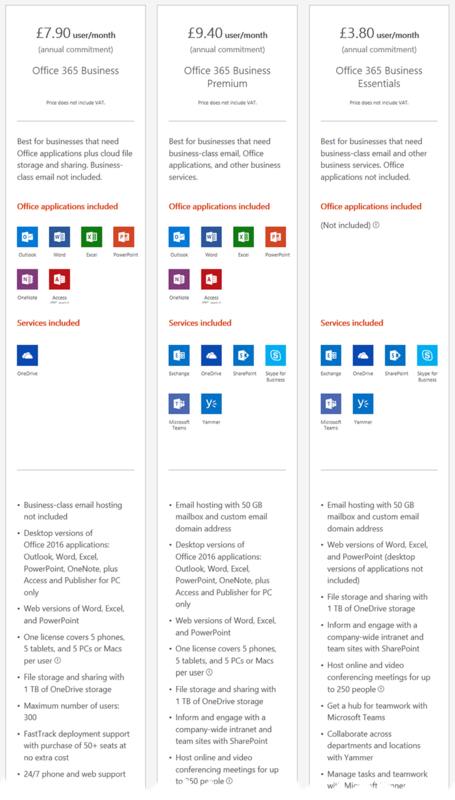 Office 365 is the leading Cloud service offered by Microsoft. It contains many of the features of Windows Small Business Server; including Exchange for email, and SharePoint which allows you and your co-workers to share and collaborate on a variety of documents. But, unlike SBS, you don’t need to invest in expensive hardware; all this is done “in the Cloud”. Also included are ‘OneDrive’– another document storage location; along with MS Lync (instant messages, video conferencing) to help everyone stay in touch. Starting at a very affordable £3.80 (plus VAT) per user per month with no upfront costs, it provides Exchange email and document storage in the ‘Cloud’. 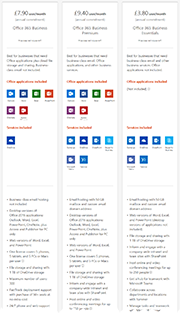 Alternative plans such as Office 365 Business Premium for £9.40 per month* include the full suite of MS Office desktop applications. Unlike the packaged version of MS Office, the user can install this on multiple devices! These can be up to 5 phones, 5 tablets and 5 desktops including Apple Macs per user. Take advantage of a free trial. Users will find the sheer convenience of being able to check and send emails anywhere or on almost any device is a winner. You can have your familiar Outlook on your desktop in the office, or open Outlook on your laptop whilst ‘on the road’ and see exactly the same things. Alternatively, you can view them on any PC (or Apple) with an internet connection, and any of wide range of browsers – not just Internet Explorer, but Safari, Firefox, Opera etc. Not only that, but you can view and edit your documents and spreadsheets almost anywhere. Additionally Office 365 works with most popular smart-phones including Blackberry, iPhone and of course the latest Windows phones. *The prices above are based on a subscription paid annually. There are also month by month options which are slightly more expensive (£3.70 or £9.70 per user per month); but give you the flexibility should your needs change during the year. The table on the right (click for full sized view) outlines the plans for small and medium businesses: There is also a range of Enterprise plans for larger businesses. Finally: this one which was originally produced for internal distribution in Microsoft. But it does point out that there is no such thing as a free lunch!